Here’s My Innovation, So Call Me, Maybe? One particularly big out-growth of OI is programs that seek to involve the wisdom of the crowd or to open firms up to ideas from individuals, rather than companies, outside the firm. This component of OI (let’s just call it Crowd Sourcing) requires a high degree of trust on the part of the collaborating partners – often small companies or individual inventors hoping that the company will respect their invention, work with them, and pay for their effort. This translates to large amounts of time spent by the companies evaluating ideas, providing feedback, and chasing imperfect leads so that the contributor feels valued and receives the desired follow-up call and feedback. Too often this part of the process of OI is white-washed by the press and enthusiastic consultants looking to help you build your own system. The promise that every company can have its own ‘Connect & Develop” (P&G’s prototypical model of how to run an OI system) seems irresistible. To the press it’s a great story that connects with the everyman – ‘you too could get rich off your ideas!’ – but should the Osmotic Innovator put time into Crowd Sourcing or are external sourcing efforts better focused in other ways? – Technical Literacy: While it’s true, as Chesborough and many others argue, that the smartest people in the world don’t work inside your company that doesn’t mean that everyone is positioned to equally understand your business model, supply chain, and regulatory pressure. This means that a large volume of the ideas you’ll see from Crowd Sourcing ignore basic realities of the business you’re actually in or are obvious incremental developments with low value to the organization. Getting a real insight or connection you haven’t seen already if you’re running an efficient OI program is rare! – Information Overload: The next problem with Crowd Sourcing is that once the gates are open and you start advertizing your willingness to pay for ideas you’ll be sorting through significant volumes of requests – trying to give each contributor an answer or feedback can become a job of its own, one with little return on the investment besides from a PR standpoint. – Exposing Your Achilles Heel: Once you’ve created your Crowd Sourcing program in order to cut back on the noise and obvious ideas you can always put out specific technical challenges to properly direct those seeking to work with you. The balance that needs to be considered with this is that the more detail you provide on the real issues you are facing, the better the feedback, but the more your competitors can come to understand your weaknesses and potentially exploit them. – The Door is Open: There’s a well-known saying that begins, “when opportunity knocks . . .” that is very apt for a Crowd Sourcing program. Simply having the Crowd Sourcing program in place makes it easier for real opportunities to find you, perhaps before they find your competitor. 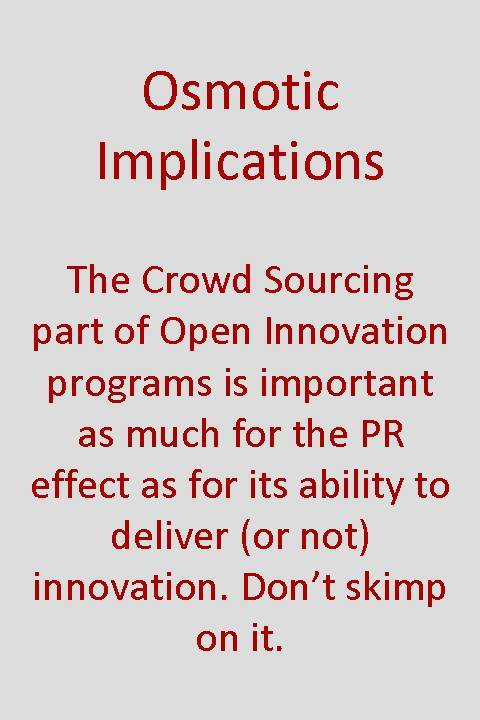 A main point to having the Crowd Sourcing component of your OI program might well be argued to be as an advertising program for your R&D department. – Wisdom of the Crowd: If you’ve ever watched the hit game show ‘Millionaire’ you know that having the crowd on your side can be a huge help. A volume of research also exists to prove that crowds do have a particular ‘wisdom’ that can direct decision making appropriately. Interfacing with the outside world has the benefit of allowing your innovation program to leverage the crowd. – Perception: Its been mentioned briefly before, but it deserves its own mention – simply having a Crowd Sourcing as part of your OI program is visible proof to the market that you’re a modern company fully taking advantage of current thinking on innovation and R&D. As well, small and medium sized companies can see the Crowd Sourcing program as proof that your company is equipped to work with them. It’s fairly obvious that there are downsides to running a Crowd Sourcing component of your innovation program, particularly the resource needed to fairly and appropriately respond to ideas. However, the author tends to find the arguments in favor of Crowd Sourcing to be compelling. In the modern R&D world, no company can expect to go it alone without extremely deep moats. Even with that kind of protection ignoring outside innovation and opportunity is a dangerous game. Having a Crowd Sourcing program, and advertizing its successes no matter how small, is invaluable in communicating with the outside world that you are truly open for business and innovation. 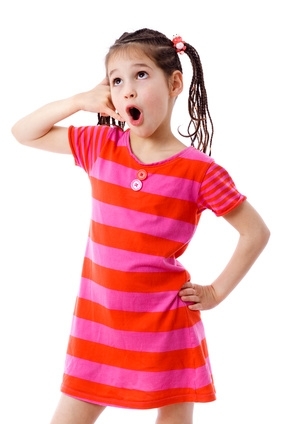 The next time someone gives you their number be sure to pick up the phone, and call them, maybe. This entry was posted in Innovation challenges, Open Innovation, Resources, Thinking and tagged Idea management, Innovation portfolio, Not invented here.